The pairing between a Scorpio man and Aries woman can be dynamite if all the cards are dealt properly. Both these individuals share similarities which will put them on the same page regarding a lot of stuff. A Scorpio man is distinct from other men in many ways and is a go getter. Many a times a relationship does not work out for a Scorpio man because his characteristics come in the way. With an Aries woman this is not that much of a problem. An Aries woman is also focused on her goals and is an ambitious woman. Loyalty is another important common virtue shared by both the Scorpio man and Aries woman. This fact though is many a time left un-realized by both of them. Scorpio man by nature is suspicious and questions the fidelity of his partner. Anybody who wants to have a relationship with him has to put up with his questions as well. An Aries woman will not be as suspicious as the Scorpio man but she will have trouble digesting the fact that many women find Scorpio man to be highly attractive. If both these individuals are capable of finding the right balance in this aspect then they should not have any problems. Then again there are some aspects of their behavior which are a problem because they are quite similar. A Scorpio man loves and treasures his freedom and will always live his life on his own terms. This also means that he would cut off any individual who might threaten this, partner included. 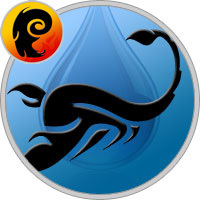 If an Aries woman or any other woman for that matter tries to reshape his life then she is in for a nasty surprise as Scorpio men do not take to pressure kindly. At the same time Scorpio men like to be the dominant force in any situation. Even if that may not be the reality it is necessary to make him feel a tiny bit superior. The Aries woman hates people watching over her as well. She does not and cannot swallow any person showing his or her dominance over her. But in this case the personality of the Scorpio man seems to be much more volatile than the Aries woman and many a times it is seen that an Aries woman will let the Scorpio man get away with a tiny bit of superior feeling. A Scorpio man generally does not cross his boundaries and does not try to overshadow the Aries woman in this case but reciprocates with love and loyalty. He respects her because she also respects him and through a bit of understanding they both are on the same plane. Sexually both of them will have fulfilling lives. There is no question of a couple like this running out of steam as they are extremely sensual humans. Adultery in both of them will not be observed unless they both are provoked by each other.